Sauté diced onions and garlic in olive oil. Add sliced okra and diced tomatoes. Season with salt, pepper, a pinch of sugar, a sprinkle of chili powder and a dash of Worcestershire sauce. Simmer and enjoy. Create mixture with yellow cornmeal, salt, and baking powder, and boiling water. Then with a piece of ice for cooling spoon a handful of mixture into hand and place in hot olive oil. Cook until golden brown. Mia Moorehead's family recipe from her grandmother Gigi. 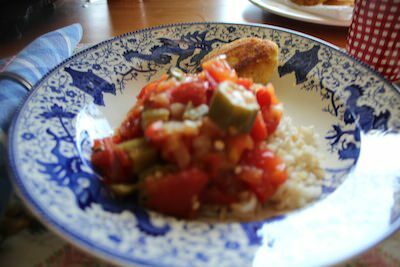 Her zesty okra gumbo and delicious cornbread balls were a hit at the table! Okra Gumbo is best served on a bed of rice for a hearty and wholesome meal!